A greyhound rescue program helps to give racing greyhounds a loving home once the dog is retired from racing. Best known for their speed around the dog track in pursuit of the electronic rabbit, this breed is very lovable and reliable. For the right person or family and lifestyle greyhounds as pets can be a perfect choice, but not everyone is suited to own one of these dogs. A greyhound rescue will take in any unwanted dogs of this breed, and then work hard to find them permanent homes with loving families. Usually this type of organization is non profit and is registered as a charitable organization. Many times any adoption fee you pay may be tax deductible. The number of greyhound racing tracks around the country is high, and once these dogs are past their prime then they are usually considered without value by the owner. Rescue groups and programs make every effort to save these dogs from a future of cruelty or euthanasia. Before you can adopt a dog from a greyhound rescue program you must submit an application and go through an interview. Many programs stipulate that if you no longer wish to keep the dog you must return it to the rescue group. As one of the hunting dog breeds in Europe through history, the greyhound is a noble breed that can be a good pet. 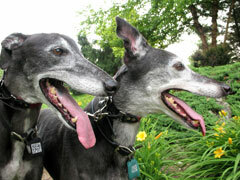 There are a number of different greyhound rescue programs situated all around the USA, and the world. The specific organization that you will need to contact will depend on where you live. Before any of the dogs are adopted out by the program the dog must pass a complete physical and have a temperament suitable for a home and family. Dog obedience training is provided before adoption, and the dog will be up to date on the vaccinations. You will also be given some information about the breed, and the specific dog that you will be adopting.